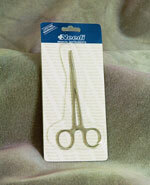 Addison Frcp Qty: 12 Size: 4 3/4"
Allis Tissue Frcp Qty: 12 Size: 6"
Baumgarten Needle Holder Qty: 12 Size: 5.5"
Bozeman Frcp CVD Qty: 12 Size: 7.5"
Bozeman Frcp Str Qty: 12 Size: 7.5"
Crile Wood Qty: 12 Size: 5"
Cuticle Nipper 4.5" 12 /box stainless steel. Dumont Splinter Forcep #3 , stainless steel , polished finished 5" Stainless steel. Forester Sponge Frcp, stainless steel , polished finished. Str Qty: 12 Size: 9.5"
Kelly Forcep 5.5" stainless steel, polished finished with packaging. Kelly Forcep Stainless steel ,polished finished; Colored Kelly Forceps 5.5" straight. Kelly Forcep Str stainless steel polished finishd Qty: 12 Size: 5.5"
Kelly Forcep 5.5" stainless steel, polished finished, straight with packaging. lly Frcp CVD Curved Qty: 12 Size: 5.5"
Kelly Forcep Purple stainless steel, polished finished. Qty: 12 Size: 5.5"
Kelly Forcep Royal Blue, stainless steel, polished finished. Qty: 12 Size: 5.5"
Kelly Forcep Teal stainless steel, polished finished. Qty: 12 Size: 5.5"